Are you remodeling? Got a leak you can’t isolate? If you need the advice of the keenest minds in civil engineering, contact Shephard Restoration Engineers (SRE) for comprehensive remodeling, inspection, and reporting services on contemporary and historic buildings in the Delaware Valley. About Shephard Restoration Engineers, Inc.
Shephard Restoration Engineers, Inc. was established in 2010 by Theresa Pearce Shephard, P.E., Assoc. AIA, a respected civil engineer with 16 years of engineering experience in the Delaware Valley. 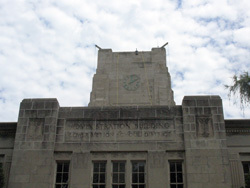 SRE specializes in restoration engineering services for historic and contemporary buildings. This can include a comprehensive building envelope consultation for historic or modern buildings, which will be a non-biased, professional evaluation of any building envelope problems your building is experiencing. SRE offers engineering consultation on a wide variety of projects, from window replacements on historic buildings to complete condominium restorations for 30-year-old high rise buildings. SRE has extensive engineering experience with a variety of building structures, including multi-unit residential buildings, K-12 schools, custom residential homes, colleges and university buildings, churches, and commercial buildings.